Robust, reliable, accurate and efficient, the Elecro Titan Optima is the ideal choice for a long-lasting swimming pool heater, which is easy to install even in limited spaces. The heater can be vertically wall-mounted using the bracket provided or stand on the floor on its two feet and offers an easy-to-program touch screen with clear blue digital characters that are legible even in bright sunlight. Whether used as a stand-alone device or back up for a heat pump the Titan Optima will provide many years of reliable maintenance free service and like all Elecro electric heaters will operate at 100% efficiency throughout its life. All Elecro electric heaters feature our unique and proven coiled heating element technology whereby a turbulent vortex is created in the water flow. This delivers outstanding efficiency and extended life expectancy by preventing the build up of mineral deposits on the heating element. Three of these signature heating element and flow tube assemblies are situated in parallel inside the Titan Optima casing and achieve outputs ranging from 18 to 120-KW. Each element bank is energised via two separate contactors with integral digital timers that minimise the potential of any voltage drops and at the same time allowing for simple, no fuss installation. The heater’s outlet manifold accommodates a flow switch that provides a digital signal to the control board, while the inlet manifold has been designed to minimise flow imbalance between the flow tubes, eliminating the risk of air locking. Safety and equipment protection is provided by a flow switch, with over-heating prevented by one auto-reset and one manual-reset thermal safety cut-out’s. 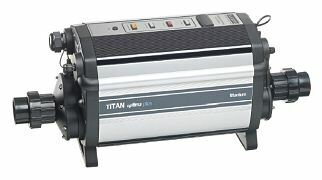 Available with titanium flow tubes, the Titan Optima plus is the ideal solution for use in sea water environments. This delivers corrosion free performance and, as a result, an extended lifecycle.